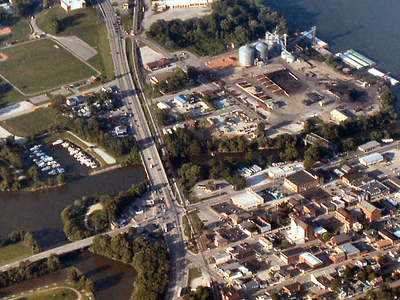 Aurora is a city in Lawrenceburg and Center townships of Dearborn County, Indiana, United States, along the Ohio River. The population was 3,965 at the 2000 census. As of the census of 2000, there were 3,965 people, 1,592 households, and 1,022 families residing in the city. The population density was 1,428.2 people per square mile (550.7/km²). There were 1,716 housing units at an average density of 618.1 per square mile (238.3/km²). The racial makeup of the city was 98.59% White, 0.10% African American, 0.33% Native American, 0.15% Asian, 0.25% from other races, and 0.58% from two or more races. Hispanic or Latino of any race were 0.61% of the population. Here's the our members favorite photos of "Cities in Indiana". Upload your photo of Aurora!